Image: Total Eclipse of January 31, 2018, photo by Cosmic News reader Peggy Lenahan. One year later, here we go again with a supermoon eclipse, taking us to the next level! 2019 has started right out with eclipses, the first subtle solar eclipse on January 6 and now our first (total!) 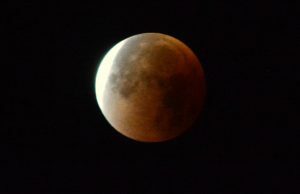 lunar eclipse changes the color and tone of our experience early on in the new year. Sandwiched tightly between Saturn and Pluto, this is a ‘no-nonsense,’ ‘Big Happenings are happening’ opening window into a fast-tracked year. All year, we continue to be under the disciplined regimen of Saturn and Pluto, implacably focused on a redesign of the way we are living on a living planet. In Capricorn, the best response is simple, basic, clean, streamlined, useful and practical. The basic pragmatic approach of Capricorn earthiness can often calm emotional turmoil, settle insecure feelings and effectively move a stagnant situation into a new gear. This Total Full Moon Eclipse is a super ‘blood’ moon, especially large because closer to Earth. A total eclipse that turns the Moon reddish, therefore called a ‘blood moon.’ This is the last total lunar eclipse until 2021. In 2018 we had two. It is also the last eclipse that occurs in the signs Leo and Aquarius, a sequence that began with the famous “Great American Eclipse of August 2017. Have you satisfactorily stepped up to the challenge of these eclipses: to show up as more of who you really are? A lunar eclipse has broader visibility than a solar eclipse. This one is basically visible from the eastern Pacific, across the Americas and the Atlantic, in Europe, Africa, the Middle East and a bit of northeastern Asia. Whether you can see it or not, welcome and respond to this stunning invitation, asa compelling opportunity to engage the energetic awakening, unexpected perspectives and surprising flashes of fresh developments on the horizons in 2019. The emotional desire of this Moon is to break through the eclipse shadows into the freedom and adventure of uncharted territory. In a few short weeks (February 17-18th), Chiron crosses the Pisces/Aries ‘event horizon,’ the point at the end and beginning of the zodiac cycle— just in time to celebrate the very next Full Moon, on February 19th. If we are willing to let this Full Moon Eclipse wash away stale energies, spiritual weariness, disconnected mentalizing; any discouragement, hopelessness, fear or anxieties that are resisting growth and openness to the brand new sparkling field of energy that is shining around us. How do we become aware that this field shimmers through own field of energy and through our bodies, charging up dormant brain cells, offering unprecedented potentials, if we are open to perceive, receive and answer the call to create the new vision. The eclipse energy may take us by surprise, with some hidden surprises hidden in its shadows. Uranus, the Wild Card Change Maker, is highly active in this eclipse, fired up for a last burst of fireworks in Aries before it grounds the lightning. Uranus plants itself in Taurus for the next seven years, starting on the March 6 New Moon. (The planets seem to be coordinating with the Moon cycle!) That’s just a couple of months from now! Last August I attended an event with mystic Beth Hin of the White Rose Foundation. She articulated, in a beautiful and uplifting way, some of the themes of our time, coordinated with the cosmic cycles.Some snippets from my notes talk about the shimmering Grace of the cosmic glitter sweeping through our cells and opening our higher heart—”God has adorned your cells from the inside out” —strengthening us to ground more deeply, to “hold more mass and more weight, occupying Earth with new consciousness, a gesture of offering.” She spoke of a recalibration of masculine and feminine (after the recent spicy tango of Mars and Venus retrogrades), for a fuller expression of our divine holiness. As Uranus claims our attention during this month’s eclipses, “The Awakener” interfaces with the Nodes of Destiny, stirring up electricity and lighting up our collective higher mind. insisting we confront and deal with “wrong thinking,” any mental negativity. Our minds so easily go there. Disengage with news that pushes a depressing or upsetting narrative. Positive-mindedness is a key to success. Watch the trend of your thoughts and edit as necessary. Turn your attention to the best potentials. Why not? That will help a lot with this next eclipse agenda. Take care and thought about how you want to use this precious personal resource. Develop your strength and hold to your center. A mature strength gives courage to move forward and sustain progress, rather than follow rash impulses in order to push on before you are ready and fizzle out. Timing is everything. I’ll be back with you on the other side of this eclipse portal!